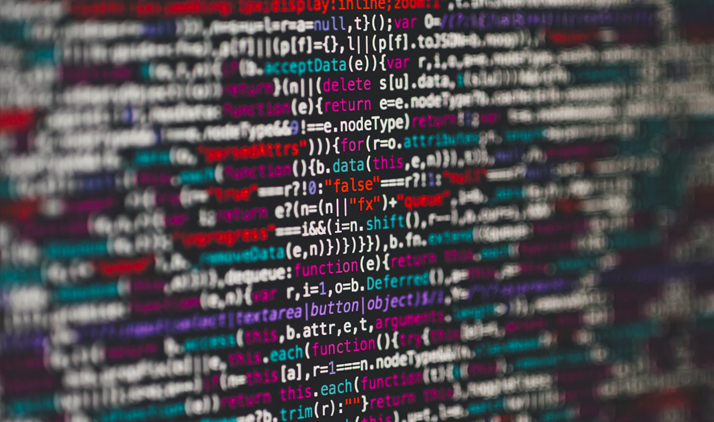 As part of the offering, we leveraged data science and machine learning to make it easier than ever before to compare the specific reasons employees are leaving one company relative to its peers. In light of this exciting news, I thought it would be fun to introduce all of my fellow data nerds out there to the process behind developing, testing, and launching Namely’s benchmarks. What’s Behind a Namely Benchmark? When we started this benchmarking work in 2018, we knew that Namely was in a unique position to explore and provide aggregated insights back to our clients and the broader HR community. While most providers of HR benchmarks collect their data through surveys sent to a variety of organizations, Namely’s historical data is a direct link to the realities of thousands of mid-sized organizations and hundreds of thousands of employees, no intermediary necessary. As a result, our benchmarks are not subject to biases resulting from incomplete benchmark survey responses or poor response rates. In other words, we can provide a more comprehensive view of the workforce at any point in time without repeating large scale surveys. This means we can produce a greater variety of benchmarks with greater speed—and continually adapt to meet the needs of the benchmarking clients we work with. How do we determine the minimum number of companies that would form a valid benchmark? How do we determine the minimum number of employees that would form a valid benchmark? Should we report the mean or the median of a number (e.g., employee turnover)? As part of our research and development process, we reached out to our partner Culture Amp to discuss their process for developing engagement benchmarks. They had used a statistical process called bootstrapping (repeatedly calculating the same metric, like turnover rate, based on a random sampling of different numbers of companies to observe how spread out the metric in each of these ‘samples’ is) to determine that their engagement benchmarks stabilized once about 20 companies were included. We adopted a similar approach to developing our benchmark and found that our results mirrored theirs! 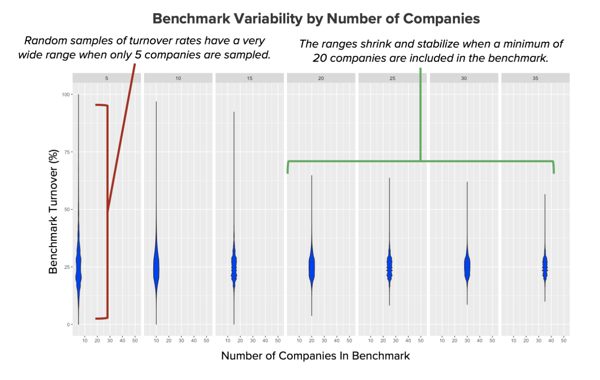 Specifically, our turnover benchmarks stabilized when we sampled a minimum of 20 companies. Having determined the appropriate minimum number of companies, we turned next to a number of employees. 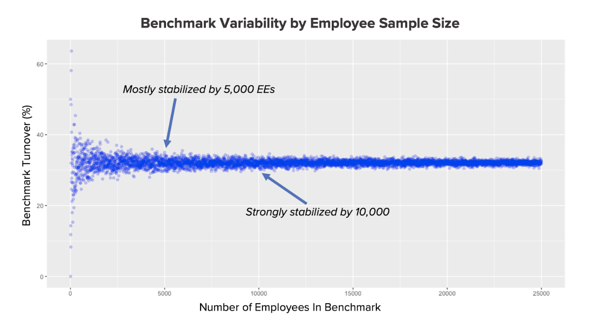 In fact, we took a very similar approach to identify the optimal employee minimum in Namely benchmarks. Here’s a slightly different visual showing that benchmark numbers stabilize dramatically during the first 5,000 employees, and continue very gradually until 10,000 employees, after which the progress is negligible. While most providers of HR benchmarks collect their data through surveys, Namely’s historical data is a direct link to the realities of hundreds of thousands of employees. Using this information (combined with what we learned about company count) we’re able to get a sense of how robust and reliable the benchmark metrics produced by any one comparison set will be. We could, for example, consider accepting a benchmark of 5,000 employees if there are at least 20 companies represented. One other critical decision we had to make was whether our “default” reporting metric would be a mean or median (e.g., of turnover). For those who haven’t had a statistics lesson in a while (or ever! ), the mean is a typical average of all values, whereas the median represents the middle value (i.e., imagine putting all the values in order and plucking out the center one). This is an important distinction for a couple of reasons. Perhaps most importantly, the mean can be heavily influenced by outliers/extreme values (e.g., companies with very high turnover) because those values “pull” the average up. The result is a number that is less representative of the whole group of numbers, but at least does directly include all values in the calculation. The median, on the other hand, represents only a single value (the middle one) in the list. However, the number is not largely influenced by outliers, because a single outlier will only “bump” the center value up or down a notch. The median is also sometimes referred to as the “50th percentile”. While there is much debate about when to use which metric, the median is often considered most appropriate when there are known outliers in the data. 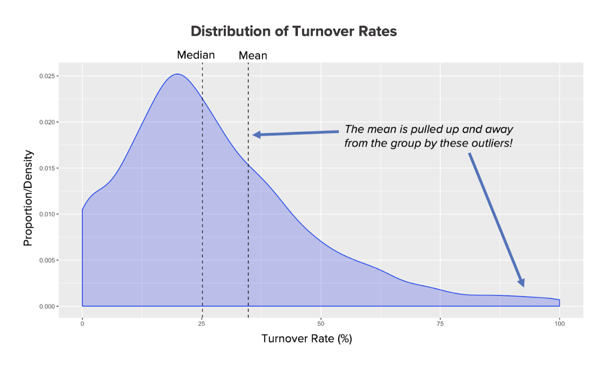 By taking a look at the distribution of turnover rates across over 1,200 companies, we observed a number of outliers which suggested we should take a median-centric approach to benchmarking. These three decisions were just a few of the key points in our journey developing Namely’s Benchmarking Package. All of this work was intended to ensure that the benchmarks we produce and provide clients are always reliable and representative of companies just like them. 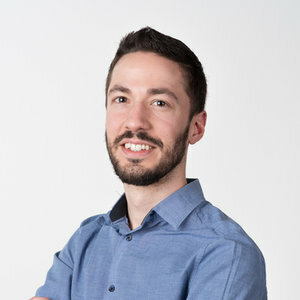 By applying the right principles, statistics, and data science, Namely has produced one of the only sets of valid HR benchmarking data, built by a mid-sized company for other mid-sized companies. Our vision at Namely is to power strategic HR decisions using data and insights, and our new Benchmarking Package is an exciting new part of that vision. Schedule a demo of Namely to learn more. If you're already a client, speak with your client success manager!